A provider of industrial storage systems approached Begoun, Inc. with a large custom metal stamping project. The customer required 50,000 units of a steel workbench leg to be delivered over a 1-year period. Their supplied print called for .075", hot rolled, pickled, and oiled steel, which had to meet tolerances of ±.005. Within 3 weeks, Begoun began delivering parts at a rate of approximately 5,000 pieces every 4-5 weeks. For more on this project, see the table below. Product Description This steel leg is used as a support for a workbench. 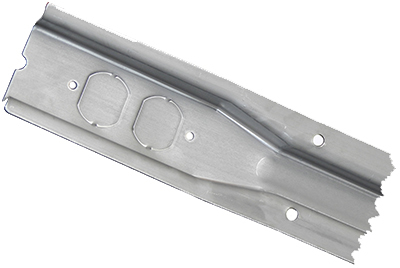 Overall Part Dimensions Material Thickness: .075"